Total new-vehicle sales are likely to have moved higher when reported on Thursday, but there's more for investors to consider. While many investors and analysts merely glance at auto sales each month, there's quite a bit of context that needs to be considered, including the difference in selling days, which will come into play for November's data; how the holiday plays out; retail share versus total market share; and, of course, incentive levels. Here's more information on the factors to consider when looking at the industry's monthly data this Thursday. According to TrueCar, Inc. (NASDAQ:TRUE) estimates, total new-vehicle sales are expected to increase 3.6% -- but because this November had two more selling days than November 2015, the daily selling rate, which is a more accurate comparison, will decline 4.7%. Another important metric, the seasonally adjusted annual rate (SAAR), is estimated to check in at 17.66 million units for the month, a decline from last year's 18.25 million. 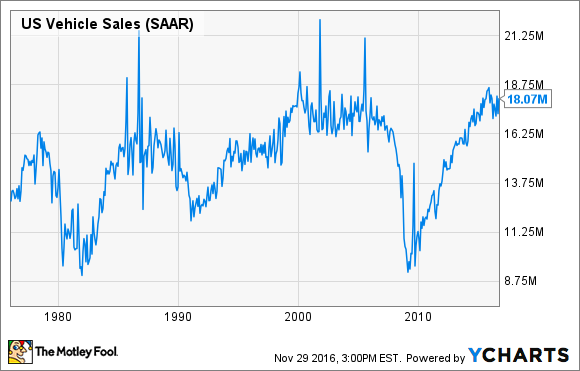 While the industry will likely fail to reach 2015's annual sales level, a SAAR of 17.66 million is still very strong historically. General Motors (NYSE:GM) offers a great example of why retail market share is a separate story in itself. While GM's total market share has been mostly flat throughout the year, that's due to a planned reduction of its fleet sales. Meanwhile, retail sales are doing quite well: GM's retail sales are expected to jump nearly 11% for November. Adjusting for the two extra selling days, it's still an increase of nearly 2%, during a month in which the industry is expected to post a 3.8% (adjusted) drop in retail sales. If GM's retail sales check in as estimated, it'll mean 17 months of gains in retail market share out of the past 20 months. Part of the healthy retail environment is holiday-related. "The early launch of Black Friday sales events is helping offset declines in fleet sales this month, as the retail sales environment remains strong for new car sales," said Eric Lyman, TrueCar's chief industry analyst, in a press release today. "Incentives are also down slightly as automakers begin to address supply side imbalances with planned reductions in vehicle production." Image source: TrueCar, Inc. press release. Don't jump to conclusions regarding Detroit automakers' higher incentive spending. Ford Motor Company (NYSE:F), General Motors, and Fiat Chrysler Automobiles (NYSE:FCAU) sell an incredible number of full-size trucks, while other automakers sell very few, if any. The F-Series, Silverado, and Ram truck ranked No. 1 through No. 3 in sales volume this year through October -- and those come with higher price tags, and thus larger incentives. In total, industry incentives are a bit of a mixed bag. For instance, while Ford's estimated year-over-year incentive increase was a staggering 23%, in absolute dollars it's still a lower rate than GM's and FCA's. Total industry incentives tell us what we already know: The market is peaking, things are getting competitive, and more incentives are in play than there were last November. With the end of 2016 in sight, the automotive industry still remains very healthy in terms of total and retail sales, although investors will want to keep an eye on incentives moving forward. While 2015 will very likely mark the peak year in this automotive cycle, the near term is still setting the stage for booming profits across the industry.